American Dish Service revolutionized the warewashing industry by introducing the low temperature, chemical sanitizing dishwasher. American Dish Service has over 45 years of experience in manufacturing commercial dishwashing products, and you can find their equipment in commercial bars, restaurants, hotels, and schools. The undercounter glasswashers and dishwashers provided by American Dish Service combine commercial warewashing technology with a compact design, allowing these models to fit under bars and between other appliances. 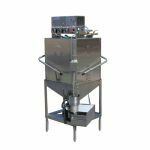 Proudly manufactured in the United States, American Dish Service provides quality warewashing equipment at affordable prices.